Since the 70s the Flying V was a very distinctive shape in the world of Electric Guitars. The original model was introduced on the market by Gibson guitar company and many well know guitar players played them such as Jimi Hendrix,Eric Clapton,and Michael and Rudolf Schenker from Scorpions among many others. Replicas of this guitar are not very common and the quality of most of them is not as good as this one,because the construction woods employed and the quality of the pickups and hardware this particular has a very good sound and playability making the price very cheap for the quality of the instrument. Jacky Jackson Guitars are made by order of a German importer on the best Orient guitar factories and that’s why they have such good quality for the price they are sold. 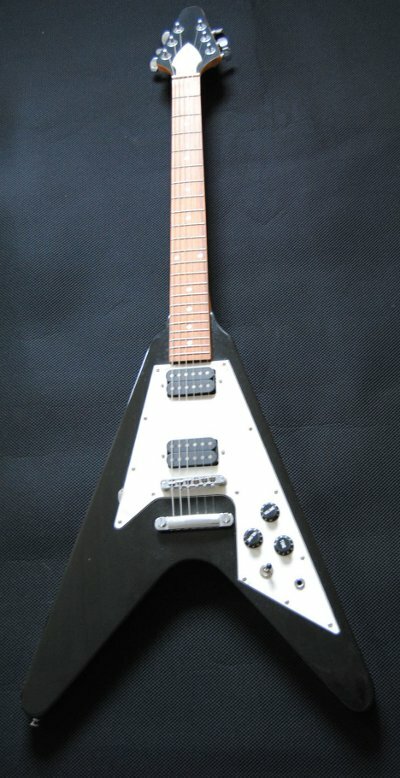 If you are looking for a good flying v replica by a very low price maybe this is the guitar you are looking for. The guitar is brand new never played and is on my collection for about 5 years ,the guitar don’t include hard case but I can supply one for more 70 extra euros. If you need more info abouth the guitar or more detailed photos contact me and I will send you the requested info.